Temperature Debate: Larry Bell’s column on Forbes on-line carried a debate between Texas State Climatologist John Nielsen-Gammon of Texas A&M University and Fred Singer, former director of the U.S. Weather Satellite Service and University of Virginia Professor Emeritus. 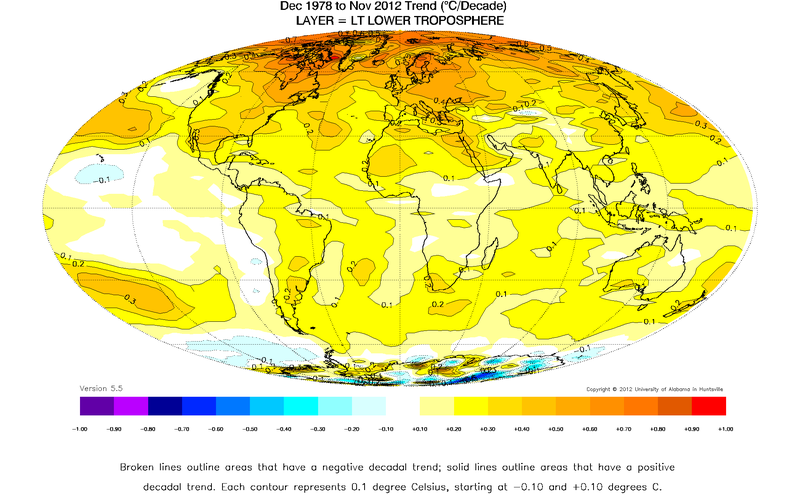 The issue is: Has there been any global warming since 1978? NIPCC in China: The editors of the two major reports by the Nongovernmental International Panel on Climate Change (NIPCC) have returned from China. Unfortunately, some commentators saw the translation of the two major reports by a unit of the Chinese Academy of Sciences (CAS) as an endorsement of the reports, which it clearly was not. The press release by the CAS stated it was to open dialogue, something sorely missing in many western countries. For that reason, some of the links carried in last week’s TWTW were taken down. No doubt, updates will come out this week. Lack of Science: The Heritage Foundation provided presentations by Patrick Michaels and Harold Doiron, with comments by Harlan Watson on the lack of science within the climate establishment and its publications. Michaels led seven person team, organized under the CATO institute, which evaluated the 2009 US government National Climate Assessment (NCA): Global Climate Change Impacts in the United States. The report was a principal source cited by the EPA in its finding that greenhouse gases (GHG), particularly carbon dioxide, (CO2), endanger human health and welfare. The new report, ADDENDUM: Global Climate Change Impacts in the United States, is laid out in a similar fashion as the earlier one, permitting side by side comparison. The report comes to significantly different conclusions than the prior one on issues such as national impacts of climate change, impacts on crop production and livestock, sea levels, life expectancy and health. On Alaska fisheries, the original report stated conclusions that are directly refuted in the original paper it cites. Harold Doiron is the leader of The Right Climate Stuff team (TRCS) comprised, mostly, of retired Apollo veterans. Doiron’s background is in complex system modeling – what the climate modelers are doing. He developed the guidance software and techniques for the lunar lander. The all-volunteer TRCS team brought in people from both sides of the issue on dangerous Anthropogenic (human caused) Global Warming (AGW) looking into the research and the data. He said that TRCS team applied the successful methodology used at NASA to find the root cause of the problem (do not assume a cause) and the use of problem definition and root causes analysis for rational decision making. The conclusions are: the science is not settled, there is no reason for alarm, and no convincing physical evidence for catastrophic AGW. The computer models need to be validated, before being used for critical decision making; and do not waste money on running models until the hard work is accomplished to show the models agree with nature. Doiron was quite harsh on the logic used by the UN Intergovernmental Panel on Climate Change (IPCC) and on the NCA. In essence, the IPCC states that the cause of recent warming must be CO2, because its unvalidated computer models cannot account for the observed warming unless it assumes strong amplifying anthropogenic warming feedback relations in the models. Doiron bluntly states this is not proof in the school of hard knocks. Mean Is Meaningless Continued: The post by Robert Brown of Duke on WUWT declaring that the mean shown in the ensemble of climate models has no meaning has caused a stir. Statistician William Briggs states that the mean of the ensemble of models, such as weather models, can have significant meaning. They may be both right, in part. Though Briggs does not discuss this, think of a US carrier fleet which is spread over a large area with airplanes operating hundreds of miles from the fleet. According to a retired naval meteorologist, the ensemble of weather models in such a fleet are being tested and updated constantly. When asked about the longest duration a weather forecast may be reliable, he replied that, on occasion, up to 11 days, provided all the models converged. Here is a critical difference in the treatment of the models. The climate models are not being tested and updated constantly, and they certainly do not converge. For the statistically inclined, Robert Brown has another post further dealing with the probabilities stated in the IPCC’s Fourth Assessment Report (AR4). Brown states that predictive modeling is difficult, and invites the authors of the Summary for Policymakers (SPM) of AR4 to “explain in detail how they derived the probability ranges that make it so easy for the policy makers to understand how likely to certain it is that we are en route to catastrophe.” Will any of these authors respond? Please see links under Statistical Issues. “However, IMO [In My Opinion] the more fundamental problems with climate models lie in the coupling of two chaotic fluids – the ocean and the atmosphere. The inability of climate models to simulate the evolution of and connections among the teleconnections [such as the Southern Oscillation] and interannual to multidecadal circulation regimes is the biggest source of problems for understanding regional climate variability. Curry seems to agree with Harold Doiron. We will not move forward in understanding the human influence on climate until we understand and can model the natural influences on climate. Adding fluff increases vagueness and wastes money. Please see link under Seeking a Common Ground. Model Foolishness: Bjørn Lomborg reminds us that 2013 is the 40th anniversary of the Limits to Growth, which used state of the art computer models that were not validated to predict that humanity faced a devastating collapse from the lack of food, oil, other commodities, etc. Forgetting this history, The World Bank has come out with a report, prepared by the alarmist Potsdam Institute for Climate Impact Research and Climate Analytics, which uses state of the art computer models that are not validated to predict that humanity faces a devastating collapse from the use of too much fossil fuels. The title, 4º Turn Down the Heat, indicates the quality of the report. It assess the impacts of a 1.5ºC, 2 ºC, and 4 ºC rise in temperatures above pre-industrial levels (roughly since the Little Ice Age). All the ills are here: heat extremes, rainfall changes, crashing agriculture production, sea-level rise, etc. It is becoming apparent, that by focusing on the results of computer models that are not validated, the World Bank is becoming an obstacle to alleviating world poverty. As part of the UK Government’s National Adaptation Programme, the consulting firm PWC prepared a similar report for the UK. 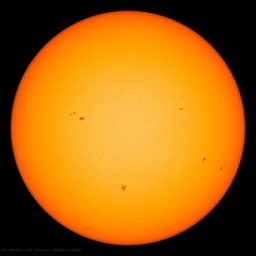 However it was based on a modest 2 ºC. The above comments concerning models apply to both reports. Please see links under Lowering Standards, Communicating Better to the Public – Make things up, and Models v. Observations. Agriculture Issues: Evidence continues to mount that increased CO2 in the atmosphere is a benefit for plants, the environment, and humanity. Reader Clyde Spencer points out that as long as the pH remains above 7, reducing the pH of an alkaline solution is not neutralizing it, but making it less alkaline. As always we appreciate those who take the time to provide amplifications and corrections. Number of the Week: $250,000 times 10,000 – Patrick Michaels, the editor-in-chief of the CATO team that prepared ADDENDUM: Global Climate Change Impacts in the United States reported that the entire effort cost CATO about $250,000, including printing. Perhaps USGCRP should hire the CATO team perform the final review and editing of the upcoming report. It may save the taxpayers considerable sums of money and better serve the public. For the numbered articles below please see this week’s TWTW at: www.sepp.org. The articles are at the end of the pdf. The green-power push is driving business to the low-cost U.S.
Democrats raid carbon-emissions auction revenue to finance more welfare spending. Electricity prices in Britain may be almost double those in Germany within three years due largely to the impact of a new tax aimed at supporting renewable power generation, a report by bank Credit Suisse has claimed. Climate Expert von Storch: Why Is Global Warming Stagnating? Since its inception, GEF has allocated $11.5 billion—supplemented by more than $57 billion in cofinancing—for more than 3,200 projects in over 165 countries. If your rates have gone up, ask if your provider is factoring “climate change” into your bill. Even Al Gore writes about coping with rising seas and temperatures as well as cutting emissions. Communicating Better to the Public – Go Personal. The shoddy science of sceptic-bashing attempts to turn criticism into a psychological illness. Lewandowsky shows that the academic institutions do not produce dialogue that has any more merit than the petty exchanges — flame wars –that the internet is famous for. Dressing political arguments up in scientific terminology risks the value of science being lost to society — its potential squandered for an edge in a political fight. Vanishing Snow: Should there be A Law? Who Dares to Deny Arctic Warming? Link to Letter: Small effect of water on upper-mantle rheology based on silicon self-diffusion coefficients. Unable to find link to paper in PNAS index. The National Science Foundation (NSF) is an independent federal agency that supports fundamental research and education across all fields of science and engineering. In fiscal year (FY) 2012, its budget was $7.0 billion. For longer life and less cancer: Pesticides!? Reference: Venn, A.A., Tambutte, E., Holcomb, M., Laurent, J., Allemand, D. and Tambutte, S. 2013. Impact of seawater acidification on pH at the tissue-skeleton interface and calcification in reef corals. Proceedings of the National Academy of Sciences USA 110: 1634-1639. Reference: Wang, H., Xiao, W., Niu, Y., Jin, C., Chai, R., Tang, C. and Zhang, Y. 2013. Nitric oxide enhances development of lateral roots in tomato (Solanum lycopersicum L.) under elevated carbon dioxide. Planta 237: 137-144. Another Test of CMIP5 Models: What Problems Were Detected? Reference: Santer, B.D., Painter, J.F., Mears, C.A., Doutriaux, C., Caldwell, P., Arblaster, J.M., Cameron-Smith, P.J., Gillett, N.P., Gleckler, P.J., Lanzante, J., Perlwitz, J., Solomon, S., Stott, P.A., Taylor, K.E., Terray, L., Thorne, P.W., Wehner, M.F., Wentz, F.J., Wigley, T.M.L., Wilcox, L.J. and Zou, C.-Z. 2013. Identifying human influences on atmospheric temperature. Proceedings of the National Academy of Sciences USA 110: 26-33. By suing the agency—which often settles—green advocates have compelled it to issue a raft of regulations. [SEPP Comment: EPA’s mission on hydraulic fracturing accomplished – scare the easily frightened. Halos and contrails: Is there a connection? Pretty funny, when you think about the Mannian knee-jerk reaction in which every paleoclimatic proxy showing the Holocene Optimum, Minoan, Roman & Medieval Warm Periods is dismissed as limited to parts of the Northern Hemisphere, despite all actual evidence to the contrary. Hail Konrad Lorenz, a true scientist. Here, Here! Madam Curry. They need to take it back to formula. 20 June: McClatchy: Marisa Taylor/Jonathan S. Landay Obama’s crackdown views leaks as aiding enemies of U.S.
Singer gave one of the worst responses, not much of a debate. Decent question poor answer. Says question is about 78 to present then proceeds to mention everything but that time. His opponent was correct in pointing out the picking of select times. Only barely motioned current leveling. If this was my only exposure to this I would have to go with CAGW. Came across as spreading FUD. Good thing I read more than just his debates.